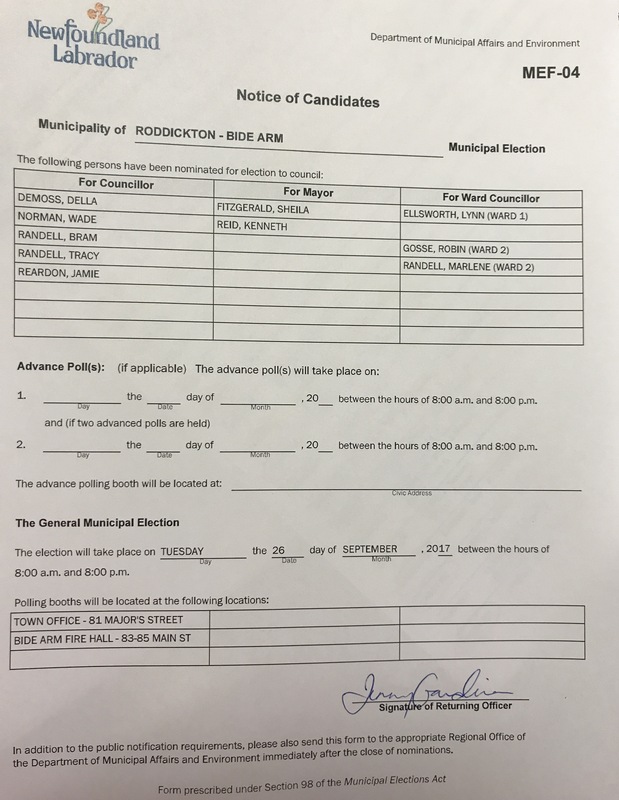 There is a Roddickton ward councillor as well but no election is required for this one position as ELLSWORTH, Lynn was acclaimed. Individuals living in Roddickton vote at the Green Moose Interpretation Centre/Town Office. All persons living in Bide Arm vote at the Bide Arm Fire Hall. No advance poll but anyone who is not able to vote on voting day can vote by proxy. Contact the Returning Officer, Jenny 457-2413 to get information on voting by proxy. Any questions can be directed to the Returning Officer, Jenny at 457-2413 during business hours. Congratulations to Councillor Lynn Ellsworth on being acclaimed as Councillor for Ward 1. Congratulations to Councillor Lynn Ellsworth on being acclaimed Ward 1 Counillor. Nomination day for Roddickton-Bide Arm is going ahead today from 8:00 am to 8:00 pm.